The New-York Historical Society offers a variety of admission options and exceptional group tours, for any group of 10 or more adults. With groundbreaking special exhibitions, over 1.6 million works of art, and displays of nearly 40,000 objects, we are positive your experience will be new, exciting, and educational. Take your college curriculum to the next level with a group visit to the New-York Historical Society. It is home to over 1.6 million works of art and 40,000 objects that tell compelling stories about New York and the nation’s history. Our tours are a perfect way to take a break from the classroom and explore history from a new and exciting vantage point. Bring your groups to the New-York Historical Society, conveniently adjacent to Central Park. We offer a bus drop-off area, expedient booking, and discounted prices. Show your clients a new and exciting way to explore New York and the nation’s history. 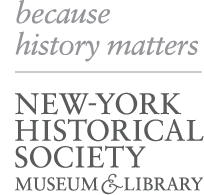 The New-York Historical Society offers exceptional museum-based, and outreach educational programs for K-12 students. To find out more information about any of our education programs please click below. Earn your next badge with some help from the New-York Historical Society! With over 1.6 million works of art and 40,000 objects, our museum offers a unique way to fulfill requirements towards badges. Earn your next badge with some help from the New-York Historical Society! Experience one of the world's greatest collections of historical artifacts, works of American art, and other materials documenting the history of the United States and New York while you fulfill requirements towards badges. Earn your next badge with some help from the New-York Historical Society! View our selection of programs designed to help Packs fulfill requirements towards Cub Scout Adventure requirements.